Often, your resume will be the initial way a potential employer gets to know you, so take the time to make sure it properly displays your best qualities in customer service and includes past experiences and retail successes. Take the time to match your qualifications to the requirements the employer has listed in the job posting. Resume samples are a useful way to guide your own writing. A sample can help you decide what kind of content you should include, as well as how to format your resume. Resume templates also can be very useful. They help you with the layout of your resume, such as how to organize its different sections. While resume samples and templates are great starting points for your own resume, be sure to always tailor a resume to fit your own skills and abilities and the job you are applying for. Review this example of a resume for a customer service job or see below for more samples, and writing tips. Attentive and detail-oriented Customer Service Representative energized by the challenges and opportunities offered within fast-paced, quality-critical call center environments. Fluent in English and Spanish. Customer Service: Interact well with callers requesting product information and technical support, responding with professionalism and empathy while proactively resolving conflicts to prevent escalation and ensure customer satisfaction. Communications: Clearly communicate with customers via telephone and online to identify individual needs and provide positive solutions. Superb active listening skills complemented by proven skill in facilitating consultative sales discussions. Leadership and Teamwork: Avid team supporter, motivating peers through personal example, a positive attitude, and a willingness to lend a hand whenever needed. Available to work overtime and on weekends to ensure adequate staffing. Technical Proficiencies: Solid command of Microsoft Office Suite and Kayako live chat software. Provide excellent customer service and technical support to customers of established internet / broadband provider during live chat sessions. Address customer issues and inquiries; liaise across accounting, sales, and technical departments to formulate winning solutions. Led team tasked with developing new customer service protocol that reduced customer wait time by 43%. Maintained a perfect attendance record while frequently stepping up to substitute for absent personnel during other shifts. Assisted customers in ordering or rescheduling flights, claiming travel awards, and confirming reservations. Actively listened to customer feedback to deescalate dissatisfied customers and retain their business. Earned title of “#1 Customer Service Representative” in 2012 based upon success in contributing to outstanding levels of overall customer satisfaction. Selected by supervisor to train and mentor new customer service agents in company’s established customer service methods and standards. Successfully handled phone sales and support for retail clothing provider. Assisted clients in product selection, processed payments, and arranged for returns. Partnered with call center manager to co-write new, positive customer service script that reduced product returns by 37%. Tailor your resume to the specific type of position you are seeking by reviewing examples of resumes related to these jobs: cashier, customer service with profile, customer service manager, customer service, retail, retail management, and sales associate. It's also a good idea to review different types of resumes, such as these examples: combination resume, chronological resume, functional resume, targeted resume, resume with accomplishments section, resume with skills section, and resume with summary of qualifications. Use keywords. Look carefully at the job listing for any keywords—important skills or qualifications—included in the listing. Try to use some of these words or terms in your own resume to make it stand out. For example, the job posting might describe the ideal candidate as "detail-oriented." Include this in your resume in a way that illustrates your attention to detail. Use action words. When describing your achievements, use action words. Words like "led," "managed," "stocked," and "processed" portray your experiences in an energetic way. Check out a list of action words for useful examples. Emphasize your related skills. Think about skills that are important in customer service and retail. These range from communication to interpersonal to sales skills. In your resume, include examples of times you displayed these skills. 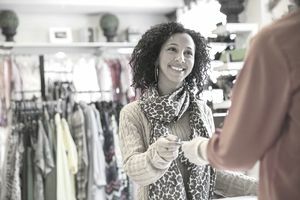 Check out a list of retail skills and a list of the top 10 soft skills for customer service in order to get additional ideas. Quantify your skills. Use numbers whenever possible to quantify your successes in sales. For example, you might include how much money you managed in the past, how many customers you assisted per day or the typical size of a sale you made. Numbers are a clear way to show your successes. They easily show an employer how you might contribute to the company. Emphasize any related academic experiences. If you have any schooling related to retail or sales, include it in your resume. For example, perhaps you majored in merchandising in college, took a high school class in business management, or even attended a seminar series about retail. Any of these related academic experiences are worth including on your resume. Edit, edit, edit. Proofread your resume carefully before submitting it. A clean, error-free resume will make you look professional. Additionally, ask a friend or family member to proofread the resume for you.